What was life on the farm like in the late 1800s? 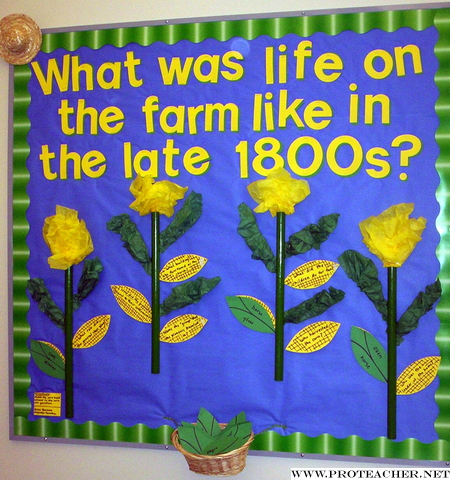 This bulletin board was created for use during a unit on "Little House on the Prairie." It is an interactive bulletin board. There are questions written on the corn cobs and answers on the corn husks. Students each got a chance to velcro the correct answers on the corn cobs. All together the questions ultimately answer the main, divergent question: "What was life like on the farm in the late 1800s?" The corn stalks are made from dowel rods cut in half and spray painted green, other parts of the corn plant are made from tissue paper and card stock. The attached basket holds the answers to the questions while not in use. Some of the questions include: "Who harvested the corn? What did the children do for fun? and Who was the head of the household?"